There are a few moments that come to mind when I think about the consistent presence of people with disabilities in the Obama White House. Stevie Wonder stopped by the Oval Office to visit with President Obama. Pete Souza captured some pictures of the two meeting, and afterward the photo office and I worked together to get President Obama’s signature brailled onto the prints that were given to Mr. Wonder. At the last holiday reception, as I walked disability advocates through the West Wing, we ran into [Valerie Jarrett], who greeted each of them with a giant hug. Over 8 years, these advocates had contributed to many difficult, tense conversations and policy decisions about elements of the Affordable Care Act, disability employment, and criminal justice reform to name a few. Town noted that during her tenure, thousands of disabled people met with President Obama and other high ranking administration officials. His administration hosted visitors from March of Dimes and met with Paralympians. 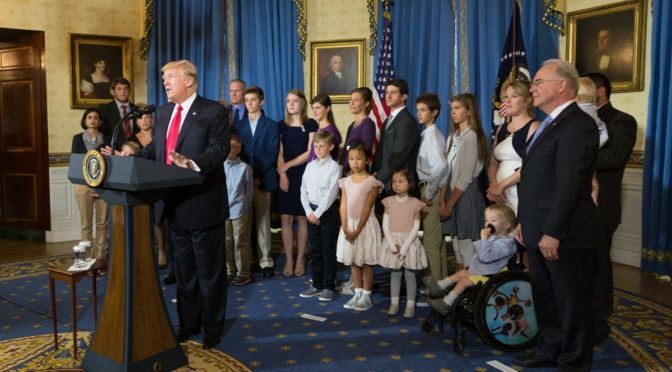 During a White House reception celebrating the 25th Anniversary of the ADA, he spoke to approximately five-hundred disabled people and nondisabled advocates for the disability community. When Maria Town left the position in 2016, the Trump White House did not move to replace her. There is no longer a White House disability liaison. The information Politico uses for their unofficial visitor log is collected from White House schedules, news stories, and pools filed by reporters who follow President Trump. NOS Magazine looked at every person in Politico’s log and sifted through publicly available articles and biographies to determine which visitors were disabled and which were not. There were some surprises. For example, we learned that SAP CEO Bill McDermott lost one of his eyes in an accident. Catholic Cardinal Daniel DiNardo, who attended this year’s annual prayer breakfast, is apparently hard of hearing. The methodology NOS Magazine used isn’t perfect. It is likely that many veterans who have visited the White House have disabilities, but that they do not identify as disabled and may not use an obvious signifier like a wheelchair, a prosthetic, or a service dog. Additionally, many of the business leaders and politicians who visited President Trump may have invisible disabilities that are not public knowledge. NOS Magazine also chose to exclude people who could not be publicly confirmed to have a disability, despite speculation. For example, while Buzz Aldrin is on many lists of famous bipolar people, he has never publicly said he is bipolar. The same goes for Bill Gates and speculation about whether he is autistic. It is also important to note that the Politico unofficial visitor log itself is imperfect. When discussing my work on this article, a disabled friend who visited the White House with Wounded Warriors Project in April asked if he was in Politico’s log. He was not, and neither was anyone else from Wounded Warriors Project. Since I do not know how many people were with him and how many of those people were disabled, I have excluded them for now. If you or anyone you know has visited the White House and is not in Politico’s visitor log, you can help them correct their information by emailing TrumpVisitors@politico.com. Additionally, if any of those people are disabled, please email nos.editorial@gmail.com and let us know. We will revise the article when new information on visits before August 24, when NOS Magazine first pulled the data. Information about who meets with the President is key to understanding any administration. Visitor logs can offer a glimpse into the interest groups and personalities that may shape the President’s decisions. Under the current administration this is especially important, as President Trump has been known to make decisions on the fly after brief conversations. For example, Trump has said that a 10 minute chat with Chinese President Xi Jinping changed his mind about China, and that he no longer considers China a “currency manipulator.” Considering that much of Trump’s campaign involved railing against China as a “currency manipulator,” this is quite a turn. It is similarly significant that Trump has interacted with so few disabled people. None of the people Trump has met have been disability community leaders beyond the military sphere. The experiences and needs of people who were born disabled or who acquired disabilities early in life are often significantly different than those who acquired disabilities in service to their country. President Trump’s interactions with ordinary disabled people (or lack thereof) could have a major impact on his attitudes towards policies that affect disabled people, especially around issues like healthcare. If President Trump changed his mind about China after a 10 minute conversation with President Xi Jinping, how might his opinion about Medicaid change after a 10 minute conversation with Kelly Buckland or Stephanie Woodward? How might the President’s opinion about the rights of nursing home residents change after speaking to a survivor of Willowbrook? How might President Trump’s opinions on autism change if he met with the Autistic Self Advocacy Network? NOS Magazine will continue to report on how the White House interacts with disabled people and the issues that affect disabled lives as President Trump’s term continues. Correction: An earlier version of this story accidentally added a 0 in the tens place. The number of disabled visitors is actually less than 1%, not less than 0.1%.